I like the seasonal Salted Caramel Hot Chocolate that Starbucks adds to their menu in the winter and it is something that I’ll definitely order if I feel like indulging in a non coffee beverage on a cold night. 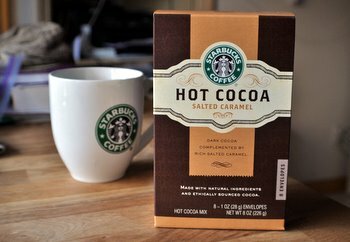 I had no idea, however, that Starbucks packaged hot cocoa mix in single serving packets (think Swiss Miss) until a friend handed me this box of Starbucks Salted Caramel Hot Cocoa Mix. The mix is made from natural ingredients – including Madagascar vanilla powder and ethically sourced cocoa powder – and the mix can boast that it is lower in calories and fat than the version that you can order in the store. The trade-off, of course, is that you don’t get the same indulgence factor as you do with the in-store version of this drink. This is a good hot chocolate mix that has salty overtones and actual pieces of caramel mixed in with the cocoa. The caramel melts into the hot milk (which you add yourself) and brings a richness that you don’t find in other hot chocolate mixes. It’s a definite plus that there are no artificial flavors and you get the real thing (including that caramel) for the overall flavor of this mix. I just might have to keep my eyes peeled for another box because I’m going through the eight included in this box surprisingly fast!